That said, none of these grudge matches are even in the same stratosphere as soccer rivalries across the globe. Derbies, as they’re referred to in soccer parlance, are the highlight of the season for supporters. To fans, these matches are frequently of more paramount concern than winning the title to fans. These matches are what sports fans live for, but far too often fan misbehavior and downright violence mars the action on the field. Passion and hatred give a derby its excitement, but when taken too far, have had dangerous and fatal consequences. In terms of sheer madness, perhaps no rivalry in world soccer tops Serbia’s “Eternal Derby” between Red Star and Partizan. Fires, grenades, pyrotechnics and broken stadium seats are nothing more than the standard operating procedure in this derby. Both sides have dominated the proceedings in Serbia. Red Star has won a total of 28 Serbian titles, while Partizan trails by only one trophy. Not once since the turn of the century has a team other than Belgrade’s two sides won the top flight. The spirited rivalry annually devolves into hatred-fueled fan violence. The animosity peaked in 1999 when a Paritzan fan shot a rocket that struck and killed a Red Star fan. In 2013, 104 fans were arrested as a result of fighting throughout the match day. 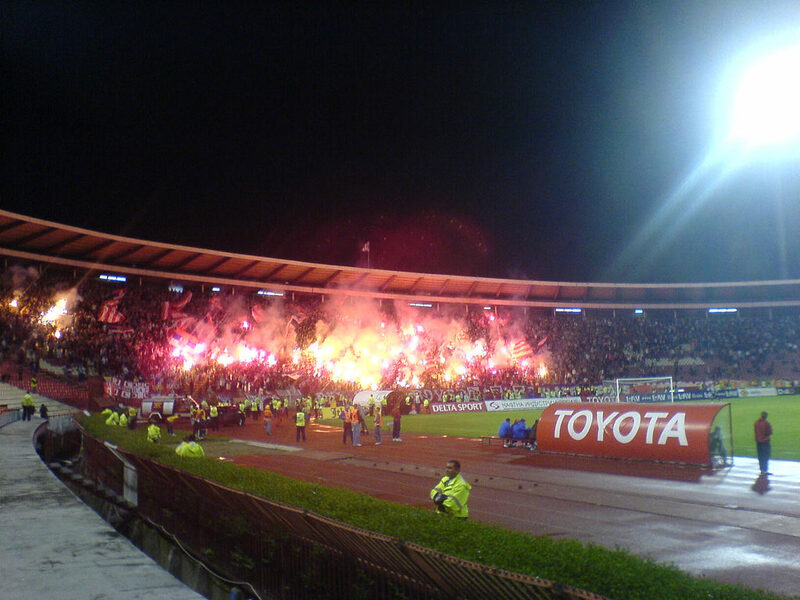 Two years later, grenades and flares delayed kickoff 45 minutes at Red Star’s Rajko Mitić Stadium. 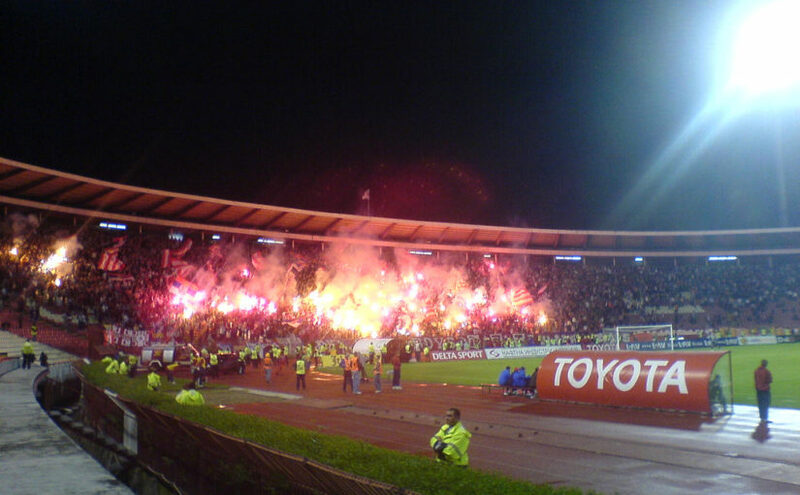 The quarrels aren’t even limited between the Delije (Red Star supporters) and Grobari (Partizan fans). During a 1-1 draw in 2017, 17 Partizan fans were injured as a result of infighting during the game. Fighting within fan groups is just as likely to be on the agenda as any other form of hysteria this game brings to light. Images of bloodied fans, spectators hurling seats and police in riot gear mark the rivalry. By no stretch is the Serbian SuperLiga one of Europe’s elite, but on two days each season it puts on incredible theater with smoke and burning stadiums front and center and a soccer game in the background. Belgrade may be the ultimate hotbed for fan misconduct, but Argentina’s capital city Buenos Aires is the home of a rivalry that is unmatched by any on the planet. The rivalry features two behemoth stadiums — Boca’s La Bombonera and River Plate’s El Monumental — with a combined capacity north of 100,000. Of course, these two stadiums provide an ideal setting for fan insanity. Gangs called the Barra Brava are responsible for countless incidents — even deaths — throughout the decades. The seminal moment in this heated rivalry’s history of fan violence came in 1968. A whopping 74 fans died when Boca Juniors’ supporters began raining burning papers down on the home River fans during the contest. Fans fled, and the deaths were a result of a stampede against a locked exit door. Twenty-six years later, Boca fans mobbed a bus carrying River Plate fans and murdered two of them. In 2013, the Argentine Football Association imposed a five-year ban on visiting fans, which has taken much of the edge out of the Superclásico. The ban was a result of rampant fan deaths. The hiatus couldn’t stop hooligans from once again impacting the derby in 2015. To protect players, the teams have inflatable tunnels to provide cover while walking out onto the field. In a Copa Libertadores matchup, the River Plate tunnel was punctured and players were bombarded with tear gas. The game was suspended, and Boca was eliminated from the tournament. The ban has been lifted, but Boca and River still do not allow visitors. The south stands of Dortmund’s Westfalenstadion are the home of perhaps the most passionate fans in all of Europe: the Yellow Wall. The freestanding wall holds 25,000 raucous supporters and is the signature of the club’s fan base. Both the club and supporters found themselves in hot water following 2017’s home match against RB Leipzig. The controversial Red Bull-owned squad made a run at the title, much to the chagrin of Germany’s traditional fans. Leipzig bypassed the Bundesliga’s 50-plus-one rule, requiring clubs — as opposed to outside sponsors — to own a majority-voting stake at all times. In response, Dortmund’s fans hurled stones and glass bottles at Leipzig supporters outside the stadium, and police said that any visiting fans were targets. BVB ultras attempted to block the Leipzig team bus from reaching the stadium prior to kickoff. Additionally, the Yellow Wall raised a banner telling Leipzig sporting director Ralf Rangnick to hang himself. The club apologized to Leipzig for the egregious fan misconduct and condemned the violence. As it was, Dortmund was already under a warning from the German Football Association from earlier fan incidents. This time, the Deustcher Fussball Bund dropped the hammer, closing the Yellow Wall for one match and fining the team €100,000.